Recently, I have been determined to expand my network to reach my dreams and goals. I know that if I want to reach my full potential and do what I love, I must constantly be looking to expand and further my network. If you are like me, you have to deal with barriers to networking and reaching your goals. My goal in 2011 is to knock down these barriers by meeting new people and strengthening my current relationships. 4 X 4 Networking Challenge: Two easy steps! 1) Each month, I will meet with 4 people that I already know but would like to get to know even better. 2) Each month, I will meet with 4 people that I don’t know but I would like to get to know. By the end of 2011, I will have added 48 new people to my network and strengthened relationships with 48 friends, co-workers, and family members! Yes, I am completely scared and not quite sure if I can do it. I don’t have much time right now since I am working full-time and going to school at night. But, I do know that if I learn to manage my time better, I can free up time during the day to meet people for lunch or coffee. I will be blogging about the challenge and look forward to sharing with you what I learn. I hope that you will join me in building relationships and reaching your goals in 2011. Don’t let the barriers like being too busy or too shy hold you back any longer! If you would like to join me in this challenge for a month or a year, leave a comment below! 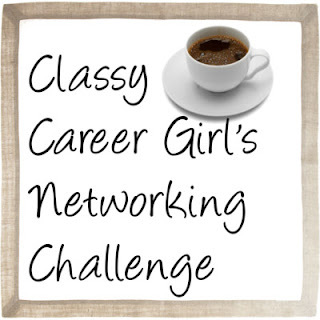 Take the Networking Challenge with me in July!